When Sephora first threw open its doors at Ngee Ann City in Singapore in late 2008, it revolutionised the beauty retail landscape in the city. Department stores no longer dominated the beauty shopping scene, and a plethora of brands were introduced to the market. By the following year, the LVMH-owned Sephora went on the offensive and opened its then-largest store in Southeast Asia, a 1,200 sq m store in Ion Orchard. Today, there are 11 outlets of the multi-brand beauty superstore; from the swanky malls on the main shopping strips to the suburbs. Over the years, Sephora has kept up its game. It introduced new and exclusive brands every quarter, such as Urban Decay, NYX, Ciate, Butter London, For Beloved One, moonshot, Nudestix, and Living Proof, as well as limited edition sets that were only available at selected Sephora stores. By the middle of 2015, Sephora bought beauty e-commerce site Luxola to ease its transition in selling goods online in Southeast Asia, and launched Sephora.sg earlier this year. To accommodate the re-shuffling of floor space at Ion Orchard, Sephora re-opened at B2 of the mall yesterday. And in its usual fashion, the launch came with exciting new brands and products, including the popular eponymous make-up line by American firebrand tattoo artist Kat Von D, cult labels Cover FX, and Zoeva. 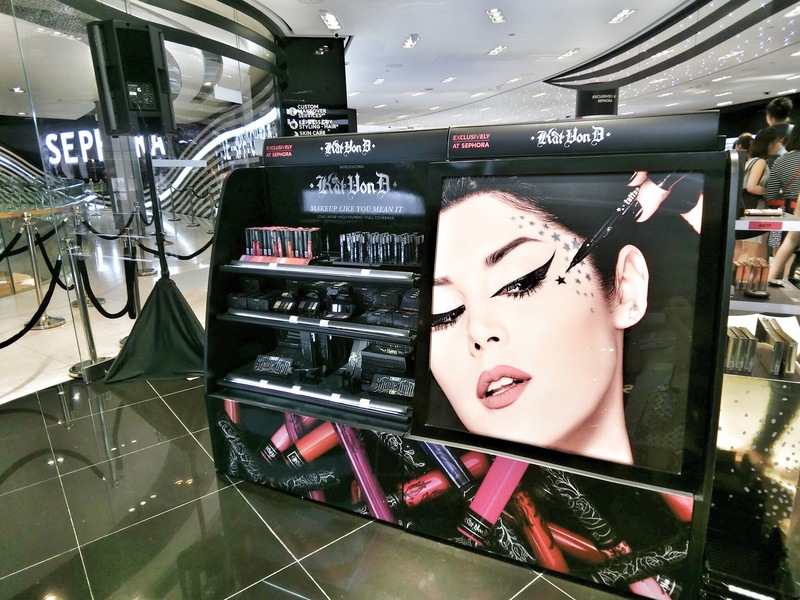 Urban Decay stocked all 100 shades of its Vice Lipstick there, and the limited edition palettes available at the launch included the Tarte Grav3yardgirl Swamp Queen Eye & Cheek Palette, and the Becca x Jaclyn Hill Champagne Collection Face Palette. Sephora Ion Orchard is located at B2-09 to 15.